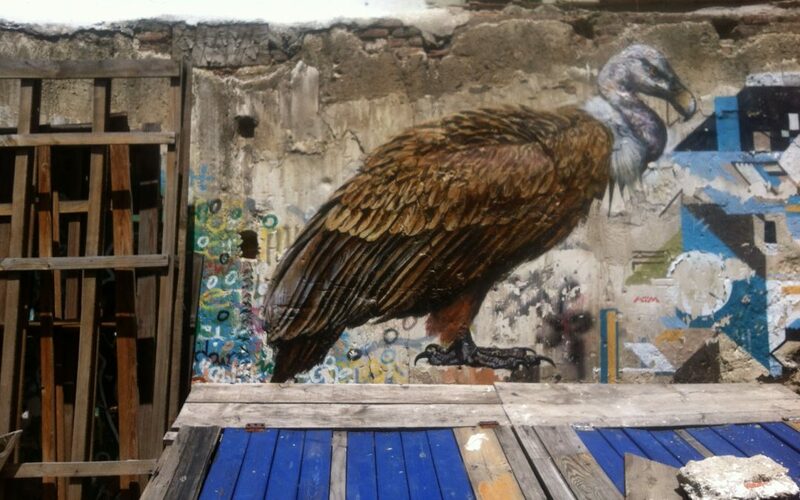 I painted this Griffon vulture last year in the beautiful garden and community space of Jardin Maravillas in Malasana, Madrid, over the compost bin. It was yet another great collaboration with The Treatment Rooms Collective and Reel News. This urban courtyard was occupied and the garden created over many years of struggle against official resistance. It now also serves as a meeting place for radical political groups, drama sessions, music practice, mosaic making and general hang-out and place of relaxation and conversation for all around. Many thanks to Shaun Dey of Reel News for setting it all up and the Treatment Rooms crew for their beautiful mosaics and company. 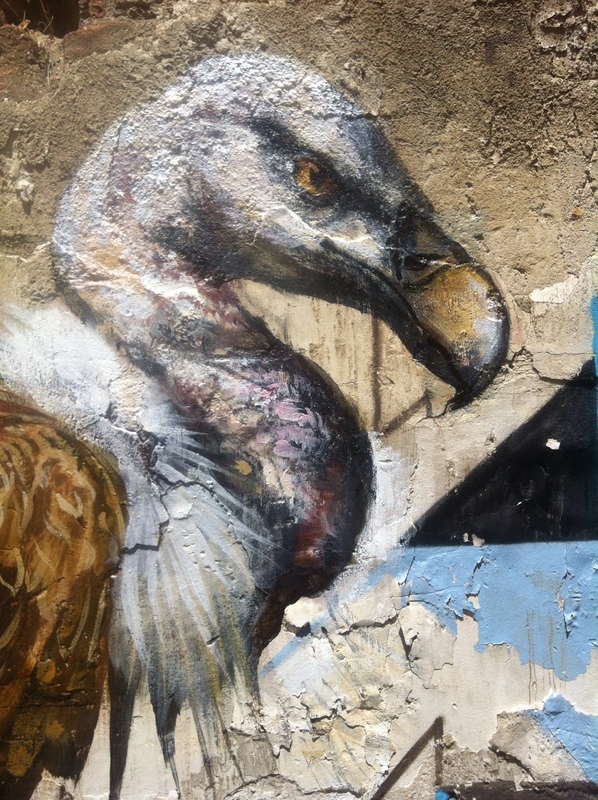 Vultures are suffering terribly worldwide, with so many species heading towards extinction. They are nature’s great clean-up merchants and hygienists; no pathogen, no matter how virulent, passes through a vulture’s gut. Their disappearance in India, inadvertently poisoned by the anti-inflammatory pain-killing cattle drug Diclofenac, has led to a huge increase in feral dog populations and rabies. In Africa they are inadvertently killed by pastoralsts leaving out poisoned carcasses in an attempt to get rid of predators that threaten their cattle. They are also intentionally poisoned by poachers to stop their giving away locations of elephant and rhino killings.